1928 Marion Sims Wyeth designed landmark home is located in the estate section on a 36, 246 sf lot. The oversized landscape and gardens were designed by celebrity landscape architect Harry Nelson while the structure was stunningly renovated inside and out by Todd Michael Glaser. 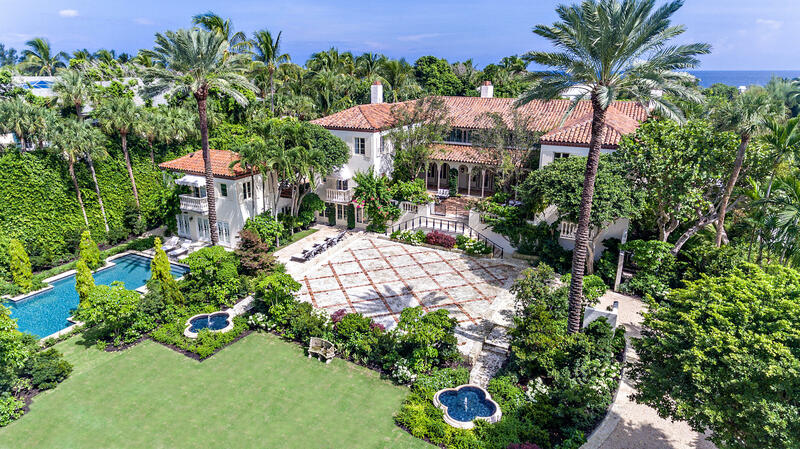 Only two houses from the ocean, this Mediterranean estate is comprised of 8 bedrooms, 9 baths and 2 half baths and totals 12, 641 sf. The impressive great room boasts a ceiling height over 25' with beautifully stenciled Pecky Cypress adding to the allure of this authentic Wyeth estate. Interior features include 3 fireplaces, 2 beautifully enclosed galleries, an elevator, sauna, wine cellar, massage and fitness room, separate guest house, poolside cabana, full house generator, cooling tower and deeded beach access.